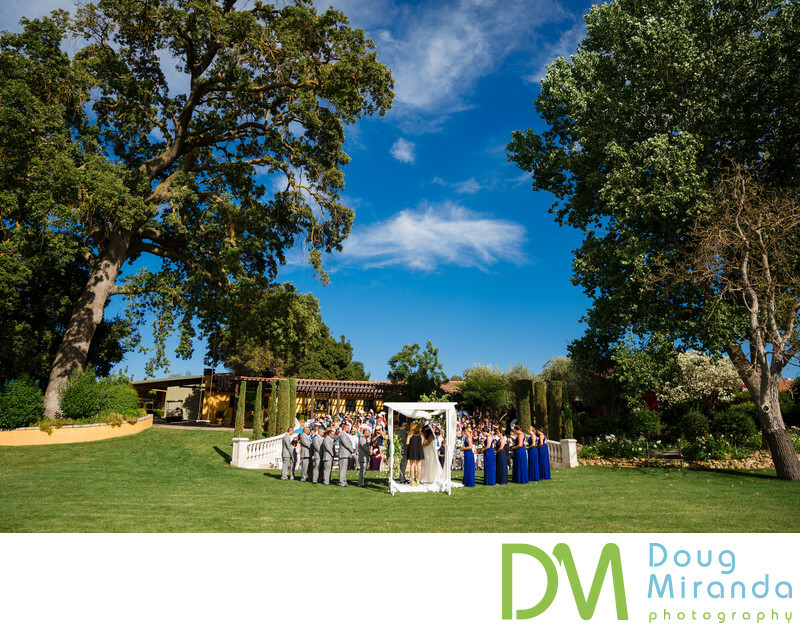 In this photo a couple is getting married on a warm summer day under the 300 year old oak tree that is on the property. This location is such an amazing spot to get married at. Viaggio Estate and Winery is located in the heart of Lodi wine county in the small community of Acampo California. Viaggio is located on 23 acres of wine vineyards and well manicured gardens with a private estate on the grounds. The Mokelumne River flows through the property, which gives it that natural feel and unique setting to the estate and winery. 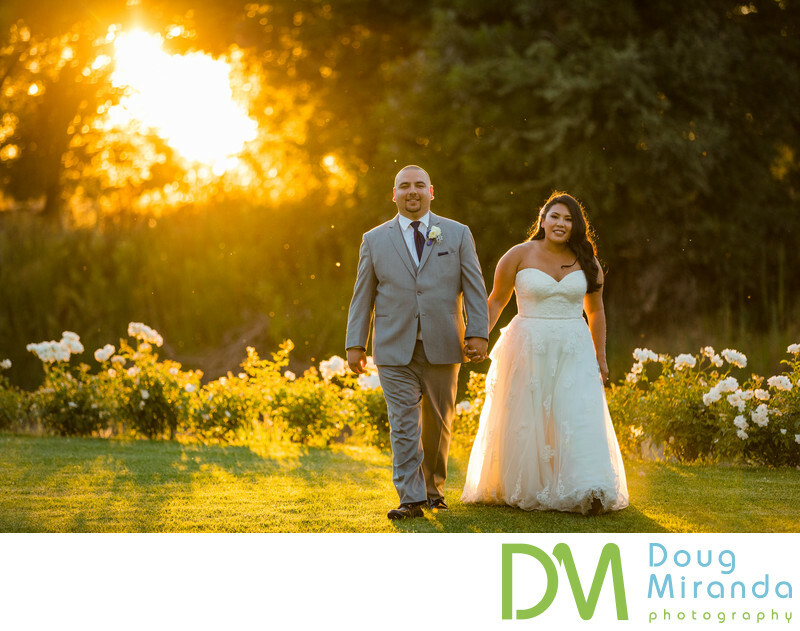 Viaggio is one of the premier wedding and event locations in the Lodi wine country or if not the greater Sacramento area. There are many locations for your ceremony to take place at on the grounds. You can pick from about five locations on the giant lower lawn area. One of the backdrops will have the Mokelumne River in the back ground or it can take place in the shade of mature trees. One of the other many locations will have your ceremony take place at the bottom of the giant auditorium like staircase that leads you down to the lawn. You will be located at the bottom, while your guest will watch the ceremony from seats on the staircase. Your cocktail hour can take place at the outside bar that is located in a spacious breezeway next to the bridal dressing room. Both the bride and groom will have spaces to get ready in before their event. The bride has a small villa for her and the bridesmaids to get ready in, while the groom has a man cave to get ready in right next to the tasting room. The man cave is decked out with a big screen tv, pool table and other games to keep the groom and groomsmen occupied before the ceremony. There is a massive Italian Villa that you can rent and get ready in and stay days prior to your wedding and after your event is over. The villa is 10,000 square feet and can sleep up to 10 people. It also has an amazing infinity pool to cool off in on those hot summer days. Your reception and party will take place in huge ballroom that is equipped to hold up to 350 guest for your festivities. This is literarily huge for couples needing a high guest capacity location, since not that many venues in the greater Sacramento area can handle that many guest. Here’s a list of some of the services that they offer for each event. Dressing room for bride and groom. Here is a list of the wedding vendors that the couple used for their event. Venue, Viaggio Estate and Winery, 100 E Taddei Rd, Acampo, CA 95220. Flowers, Embellish Floral Design, Stockton CA. Ice cream sandwiches, Pink Turtle Shoppe, 245 Eleventh St, Tracy, CA 95376. DJ, DJ Frank Lugo Jr. Location: 100 E Taddei Rd, Acampo, CA 95220. Keywords: Viaggio Estate & Winery (21).